I am SO WAY HYPED (as I mentioned over at 5 Minutes for Books). We're replacing our regular Children's Classics carnival with a Children's Classics Mystery Challenge for the months of January - June. So, in addition to the Nancy Drew Challenge (which I mentioned I would be doing) I will also be reading around a few other fun characters from the past - like Trixie Belden, Cherry Ames and a new one I picked up the other day - Robin Kane. I'm also quite excited because I was browsing a used bookstore this past weekend and found a 1930 first edition of Nancy Drew and The Secret of the Old Clock! (I prefer the 1930's editions.) My heart was singing!!! We really do hope that you'll revisit some old classic mysteries with us over the course of the first half of the year. Feel free to double up your challenges (like I'll be doing!). 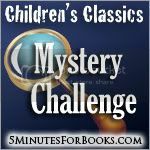 We wanted to create a challenge at 5 Minutes for Books that provided plenty of flexibility and opportunity to learn about a variety of series and I think we can do it with the Children's Classics Mystery Challenge. Looking forward to it and hoping you'll join in! I just checked my shelf for my Nancy Drew books. HORRORS! They aren't there!! I think my mom must still have them which means they are in a storage building and probably about ruined. sigh.. at least I have the Trixie Belden books. I have to write up my post, but I have a Trixie Belden book from the 60's (or 50's??) that was my Mom's!! It's very cool. But all of my buff-colored paperbacks -- I don't know where they are. Probably hanging out with Stephanie's somewhere. I know you like Amanda now so I can tell you that when I made her read Trixie Belden, she declared them "boring."